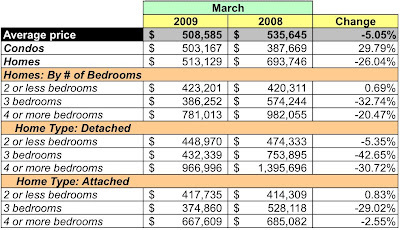 Last week MRIS released its data for signed sales contracts for existing home and condos in the District during March 2009. I have to say it was an odd month. As you can see below, all metrics - save transaction volume - were negative. When you look at the data, you'd think there's a sudden boomlet in condo sales since MRIS' data show a 16.37% increase in dollar volume and an almost 30% increase in average sales prices for that market. However, a little investigation showed that ten condos sold for more than $1MM; two cost between $2.5-5MM and one sold for more than $5MM. The latter, located at the Georgetown Ritz-Carlton, sold for $7.295MM and was the subject of a story by my buddies at UrbanTurf. Since MRIS' data aren't granular enough for detailed analysis, it's difficult to determine the degree to which these particular sales skewed the market. At least until I analyze the District's sales data. Since the Ritz-Carlton sale clouds an effective analysis of the month's sales using MRIS data, I declare the month null and void thanks to the Gazillionare Effect. More homes sold [up 14.21%], but at lower prices [down 26.04%], so overall dollar volume was 15.52% lower. Nineteen homes sold for more than $1MM. YoY, condo unit sales fell 10.34% and average prices rose 29.79%, which is is questionable thanks to the gazillionaire's purchase at the Ritz. Based on March's sales volume, there is a 9.07 month inventory of condos listed [a huge 43.76% decrease from February] and 9 month's supply for homes [a 25.04% decrease]. 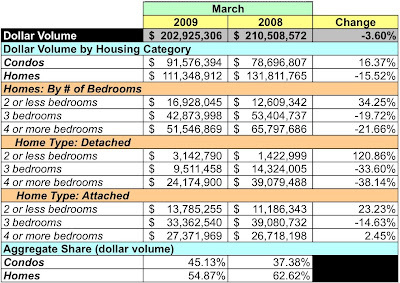 Compared to February 2008, the number of condos listed is up 1.98%, while home listings grew 8.14%. I wonder what the condo fee is at the Ritz-Carlton. I've read elsewhere that what were seeing (ie the pop in home sales) is due to the income tax credit people can now take advantage of. Once those people buy homes (Ie over the next month or so) we will see a temporary growth in home sales and then another slump after they are no longer on the market. Are you going to post any details about the winning house? I doubt the $8K tax credit is enough to cause much of a bump in real estate sales in the District. As I understand it, the $8K comes through a $1:$1 credit when you pay your 2009 taxes; at best, the only way to get that money into your pocket today, when it makes a difference, is by hiking your W-4 exemptions enough to start banking the increase in take home pay. However, it would take a while for that to accumulate to the point where it would be helpful in making a purchase. And until it's in the bank, it won't help with down payment or closing costs. A realtor I talked to today said he's seen no impact on his activity due to the tax credit. So, until empirical data are available that prove the reports, I attribute all those articles to a reporter filling some space to make a deadline. Oh, interesting as I thought the tax credit was 8k on top of your normal tax return (or a debit if you owe taxes); you sure on that part? Regardless just from talking to friends in my circle the tax credit have given them incentive to start looking. Whether that turns into sales is another thing altogether (or if my circle of friends are different from other buyers). An economist will argue that a consumer who knows his income will increase in the future (ie the tax credit) will increase his current consumption. This increase could come in the form of a home purchase. I do agree though we won't fully know until data is there to prove the point, one way or another. With the $8000 tax credit, you lower taxes owed by $8000 next April 15, unless you qualify to apply it to your 2008 taxes.